SUBJECT: Amendments to the National Commission for Women Act, 1990. Save Family Foundation is part of the Save Indian Family Movement which has been working on the social cause of promoting family and marital harmony since 2005. The movement is 40+ NGOs strong which are non-funded, non-profit and absolutely non-commercial. The movement has helped over 20 crores Indians in past 10 years by providing community help to them. The movement focuses primarily on Men Suicide in India because of distress caused by Misuse of various Gender Based Laws. A disturbed Man or loss of a son/brother/father/husband effects the complete family and devastates them. With this letter we wish to strongly object and oppose the Amendments suggested by National Commission of Women (NCW) vide The Commission for Women (Amendment) Bill, 2000. With the said amendments, NCW has proposed to acquire powers of a Civil Court of India for matters related to Crime Against Women. 1. Mandate of NCW includes Investigate and examine all matters relating to the safeguards provided for women under the Constitution and other laws. This means, that mandate of NCW is ONLY for Women and thus a body which is mandated to protect interest of only one part of a family/society (generally overriding the interest of Children, Senior Citizens and Men) cannot even be considered for such an amendment. When, Judicial officers have duty to be impartial, can a body like NCW be ever be trusted for duty of any court, when it’s mandate itself is for protecting the interest of Women and NOT Citizens. 3. We hereby also wish to show you the reality of our apprehension based on official reply from the West Bengal Women’s Commission to a complaint filed by a senior citizen mother against harassment done to her by her Daughter in Law. Can a biased organization thus be entrusted with such an unbiased role? The State Women Commission (State of West Bengal) denied picking the complaint from an old Mother-In-Law of the harassment done to her by her Daughter-in-Law as a matter of POLICY. 4. With such an amendment, NCW, has questioned the very need of having courts in India. This amendment is in reality questioning the sheer ability of our Hon’ble Courts by proposal of taking matter in their own hands. Thus, such a proposal is a big threat to the existence of the Constitution itself and hence needs to be struck down with directions to NCW to first become impartial and atleast treat Wife & Motherr-in-Laws/Sister-in-Laws, all as Women. 5. As it is, India under influence and push of one-sided data consideration, has made 49 laws which are Gender Biased (defying the section 15 of constitution of India). By a proposal to give powers of a Civil Court to NCW, it would further infringe the fundamental rights on Men, Children and Senior citizens. Empowerment must not be provided by infringing rights of others. Provided that it shall apply to the State of Jammu & Kashmir only in so far as it pertains to the matters relatable to any of the entries enumerated in List I or List III in the Seventh Schedule to the Constitution as applicable to that State. As the NCW receives a number of representations from J&K regarding violation of women’s rights, the Commission’s presence in the State is vital for safeguarding the rights of women in that State. The jurisdiction of the Commission, therefore, needs to be extended to the State of Jammu and Kashmir also. 1. NHRC extends its powers to J&K in current manner only. When citizens could reach out to NHRC from J&K then why another commission needed in J&K? CPC – India EXCEPT J&K & Nagaland and Tribal Areas. (h) “Regulation” means Regulations framed by the Commission under Section----of the Act. To bring clarity of the terms occurring in various provisions of the Act for better interpretation. The definition of ‘Complainant’ is completely wrong as per any law of the land. Indian law only allows an actual complainant to file a complaint via his/her legal representative. An organization, if given a right to file complaints on behalf and be treated as a complainant, it would be gross injustice done to the other party. As it is, various Courts of India, including Hon’ble Supreme Court, have highlighted GROSS misuse of various Gender Biased Laws and with organizations being given authority to be a complainant, India will be responsible of increased Suicide in Men & even increase in Crime because of no way out left for men. Lot of such organizations are already infamous for using false litigations to put pressure on the opposite Party. So such a gender biased organisation, filing a gender biased law based complaint in a Gender Based body like NCW, is the darkest future of India as a Country. Please see this report on how such organizations have grossly misused Gender Biased Laws. A complainant, has to be a DIRECT aggrieved party ONLY and NOBODY ELSE. (ii) an officer who is a member of a civil service of the Union or an all-India service or holds a civil post under the Union with appropriate experience. (b) a Member Secretary to be nominated by the Central Government who shall be an officer who is a member of a civil service of the Union or an all- India service or holds a civil post under the Union with appropriate experience. This helps in bringing transparency in identifying the incumbents and serves the cause of public accountability. Since, Member Secretary of the Commission is required to coordinate with various authorities and State Governments from time to time, it is felt desirable to fill the position only by a civil servant for effective functioning. Women, Women, Women, thats all written all through the mandate of NCW. Does the Ministry appreciate existence of Men, Children, Senior Citizens? Who will take care of these ignored set? Giving additional power to NCW is a HUGE infringement to the rights and sheer existence of other Gender. NCW Chairmanship has a history of Political infighting to grab the position. This fact itself proves the fact of how lucrative the position is considered to be. It is sad to see that Chairmanship eligibility is not even thinking about if the candidate has a history of working towards making Women Self-Reliant. Historically, Chairman have been people who are working towards infringing rights of Men to give false feeling of empowerment to Women. Is this what it is supposed to be? (i) In the event of occurrence of vacancy in the office of chairperson and members by reason of death, resignation or otherwise, the Central Government to fill the vacancy within 90 days and the person so appointed shall hold office for remainder of the term of office of the previous incumbent in whose place, he/she is appointed. The Chairperson must first be evaluated and recruited based on the history of the candidate on working of policies of self-reliance rather than parasitic policies of burdening the Men or the tax payers. If the objective itself of the commission isn’t self-reliance, then it cannot claim what it claims. The Central Government shall provide the Commission with such officers and employees as may be necessary for the efficient performance of the functions of the Commission under this Act. (i) Availability of a police officer brings quality in the investigation by the Commission. India, as a country has alarming shortage of basic services which are MANDATORY for a country to run and instead of bring these services to normal, the commission wants the Government to keep filling their Human Resources? referred to in clause (b) of sub-section (1) to be laid before each House of Parliament along with a memorandum explaining the action taken or proposed to be taken on the recommendations relating to the Union and the reasons for the non-acceptance, if any, =of any of such recommendations. report or part to such State Government who shall cause it to be laid before the Legislature of the State along with a memorandum explaining the action taken or proposed to be taken on the recommendations relating to the State and the reasons for the non acceptance, if any, of any of such recommendations. f. any other matter which may be prescribed. relating to the Union and the reasons for the non-acceptance, if any, of any of such recommendations. (3) Where any such report or any part thereof relates to any matter with which any State Government is concerned, the Commission shall forward a copy of such report or part to such State Government who shall cause it to be laid before the Legislature of the State along with a memorandum explaining the action taken or proposed to be taken on the recommendations relating to the State and the reasons for the non-acceptance, if any, of any of such recommendations. Existing section 10(4) is deleted here and given a placement in the proposed chapter relating to investigation. To bring clarity, the term ‘look into’ is proposed to be replaced by the term ‘investigate. a. India as a country has Police Structure & even other intelligence and investigation agencies to take care of violations of law, why should parallel investigation agencies run based on special alleged requirements? c. It is an irony of this country that when it comes to making laws in India, only 1 gender is represented fully while other Gender, age groups are completely ignored as even NFHS doesn’t include men nor does NCRB report crime against men. It is a dire need to have National Commission for Men. d. Laws should be made after lot of thinking and discussions and cannot be made at Knee Jerk Reactions or that or reports submitted by Bodies whose mandate is not for the country or it’s citizens but purely for a particular gender. India has suffered enough at the hands of laws made at such un-thoughtful and biased views. NCW should be taken away from this process as one-sided reports work towards biasing the thoughts and views of Law Makers and thus making laws which are prone to Misuse and hence have directly affected very life and existence of the ignored Gender, Men. e. Any cases of violations of Human Rights of Citizens or that of violation of Laws of the land has appropriate existing authorities namely NHRC & the Court of Law respectively to take care of any such violation. If we need to have a watchdog everywhere then there is a dire need of a watchdog of that watchdog and then another watchdog and so on and so forth. Where does the responsibility end then? i. NHRC is there doing the same job. Why duplication? ii. NHRC, Court of Law, Ministry of Women and Child Development, Ministry of Social Justice jointly cover it. Why a need of duplication? iii. Compliance of policies is the responsibility of execution bodies and there are more and enough safeguards internally in those departments to monitor and take corrective actions. If NCW only has to do the entire watchdog’s work, then why waste tax payers’ money to have such big Departments on Legislation & executive bodies? g. NCW has a proven history of helping women ONLY against alleged atrocities / harassment done by Men. 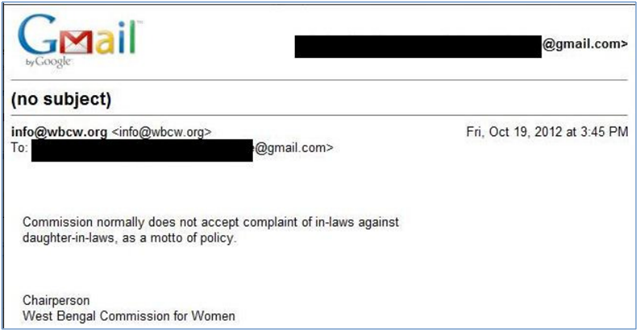 NCW has always kept it’s silence on alleged atrocities / harassment done to women by another women. Hence, the body must not be allowed to run any one side researches to just create an Anti-Male environment in the society. h. Has NCW ever taken a study towards making women self reliant? If no, isn’t NCW being regressive on it’s thoughts & targets? i. Socio-economic development is needed for citizen as a whole. Deprivation is nothing to do with Gender but with socio-economic status. j. NCW cannot be given an authority above of State and Union to evaluate. l. Legislation has to be as per the need based on independent and unbiased data. Funding a Legislation is the gross violation of independent legislation in any democracy. m. Government cannot be fed on one-sided data. Need of making National Commission for Men and then only get data for all Genders and not to cloud the understanding. (2) If Government has to be made answerable, why is that answerability being made Gender Biased? This should ONLY by done by NHRC and if is to be done for Genders then first make National Commission for Men. (3) States / Union cannot be made answerable to actions taken on report made by a Gender Biased agency. Data is collected to it’s own convenience. NCW has never done studies for citizen at general. Who is doing this for Men? This recommendation looks more as an attempt to force Legislation & Governments at whims and fancies of a body like NCW which does NOT have mandate for all Genders, Ages, and Citizens. (4) THIS IS GROSS VIOLATION OF FUNDAMENTAL RIGHTS OF MEN. When the commission does not have mandate to protecting Men, how can it be given any rights even closer to a Civil Court? Courts are supposed to follow principle of Natural Justice which will go VIOLATED if one gender is supposed to be ONLY A RESPONDENT. So, India is heading towards making a Justice system where Men will ALWAYS BE RESPONDENT? MEN WILL HAVE NO RIGHT TO START LITIGATION? a. India is now a country where a man under litigation (as a respondent) goes through multiple cases for the same alleged offence thus violating his Human Rights Guaranteed under Section 20(2) of Constitution of India. With this proposed amendment, a man, on just a written complaint, would simultaneously summoned by a Mahila Thana & a Court & even NCW now? Isnt this gross violation of Human Rights of Men? b. Giving investigative authority to the commission shows a total lack of authority of police. If NCW is so doubtful about usefulness of work, Mahila Thana or CAW cell MUST be closed down first and a bigger debate should be initiated along with Men’s Rights Organizations on this. c. NCW takes evidences or does investigation in very biased manner with focus of blaming men for all crimes. Such a body cannot be entrusted with any such powers. d. If the target of these amendments is to run parallel justice system, we would be inducing further delay in already delayed justice mechanism. Government must instead look towards strengthening the Justice system by first making more courts and filling all vacancies of Judges. e. NCW does not have any mandate to allow men to file complaints of harassment done to them and will always start proceedings with man being a respondent and hence a biased system for any witness recording or examination. We cannot allow NCW to question authenticity of the Judicial Justice delivery system. As it is the Justice system is sometimes Anti Male in it’s judgements but still citizens have some trust left on Judiciary. This amendment would take away that trust too from Judiciary. f. Strongly opposed as an open ended demand will be MISUSED like so many laws which are MISUSED already. documents; and f. any other matter which may be prescribed. III. The commission shall have the power to require, subject to any privilege which may be claimed by the person under any law for the time being in force, to furnish any information in respect of the subject matter of the enquiry who shall be deemed to be legally bound to furnish such information with in the meaning of section 176 and 177 of IPC. IV. The Commission shall be deemed to be a civil court when any offence as described in section 175, 178, 179,180 or section 228 of the IPC is committed in the view or presence of the Commission, the Commission may, after recording the facts, forward any case to a Magistrate having jurisdiction to try the same and the Magistrate to whom any such case is forwarded shall proceed to hear the complaint against the accused as if the case has been forwarded to him under section 346 of the Code of Criminal Procedure, 1973. V. Every proceeding before the commission shall be deemed to be a judicial proceeding with in the meaning of sections 193 and 228, and for the purposes of section 196, of the Indian Penal Code, and the Commission shall be deemed to be a civil court for all the purposes of section 195 and Chapter XXVI of the Code of Criminal Procedure, 1973. VI. The Commission or any other officer, not below the rank of a Gazetted Officer, specially authorised in this behalf by the Commission may enter any building or place where the Commission has reason to believe that any document relating to subject matter of enquiry may be found, and may seize any such document or take extracts or copies there from subject to provisions of section 100 of the Code of Criminal Procedure, 1973, in so far as it may be applicable. while discharging its functions under Section 10(1)(a) and 10(1)(f)(i) of the Act. 10 (4) THIS IS GROSS VIOLATION OF FUNDAMENTAL RIGHTS OF MEN. When the commission does not have mandate to protecting Men, how can it be given any rights even closer to a Civil Court? So, India is heading towards making a Justice system where Men will ALWAYS BE RESPONDENT? MEN WILL HAVE NO RIGHT TO START LITIGATION? (iv) Notwithstanding anything in sub-clauses (i) (ii) & (iii) call for further particulars or information from any person or authority against whom any complaint has been made or initiate an enquiry. (c) Recommend to the concerned Government or authority at any stage of the inquiry for the grant of such immediate interim relief to the complaint or the members of her family as the Commission may considered necessary. A well laid-down procedure will facilitate smooth conduct of business and will prevent avoidable litigation. (i) Proposed Amendment brings in parallel investigation and justice system based on Gender. Instead of bridging the gender divide already created by 49 Gender Biased Laws and 1 Gender specific Ministry, 1 Gender biased Commission. How can a commission given such kind of rights? If the objective is to doubt the effectiveness of Judicial system then the commission is questioning very existence of Democracy in India. (ii) Is Justice expected from a biased organization? Can a biased organization decide picking or dropping complaints at it’s choice? (iii) A biased organization, a selective picking of complaints & a mandate no covering citizens, how can such a power be handed over to NCW? (iv) This single proposed amendment brings our apprehension & opposition to reality. A man or an authority would ALWAYS BE A RESPONDENT ONLY. This would be a One of the most unique feature which will make the whole world question our understanding of Democracy and if we even give slightest respect to our Constitution. (v) Within this proposed amendment, the commission is absolutely clear about taking care of rights of only Women. Is this Principle of Natural Justice that the Judicial system needs to run on? (a) A Biased Court which will prosecute Men? India will soon be Anarchy for Women and Slavery for Men. Is this the definition of democracy? (b) This is done even currently by NCW so does that mean they are doing it crossing their boundary of their mandate? NCW has been filing few curative petitions against Justice & Orders announced by various High Courts & Hon’ble Supreme Court of India. (c) Relief only for a Complainant. What about relief to a Respondent to a false case? What about relief to a victim of opposite Gender? Is India giving NCW Civil Court and stop women from using actual Judiciary and Civil Courts of India? Clear violation of Principle of Natural Justice. Acts done in Good faith - No prosecution or other legal proceeding shall lie against any member of the Commission or any officer or other employee of the Commission or any person acting under directions of the Commission, in respect of anything which is in good faith done or intended to be done in pursuance of this Act or any rules, regulations or orders made there under. This insulates the functionaries from facing legal proceedings in respect of acts done in good faith as per the provisions of the Act. Whereas India as a country is talking about Judicial Accountability Bill and current laid out processes of superior courts keeping an eye on the Justice system’s honesty in subordinate courts, NCW is asking for prime and unquestionable authority. When this is not even given to Judiciary of India, isn’t this demand being made out of oblique intentions? MUST NOT BE GRANTED AT ALL. 1. No.21. The National Commission for Women Act, 1990 must be rejected at very proposal stage. 2. National Commission of Women must be strongly directed to adhere to their constitutional mandate and not to differ between Women themselves. Else, they should be renamed to “National Commission for Wives” instead. 3. It is dire need of the hour to constitute “National Commission for Men” if men have to feel any safer in India. Requesting your immediate support and directions on the above listed requests. How they can give court powers to NCW? They are biased and will favor only wife. Giving the power to NCW will promote more suicides of husband's and crime by women in society.